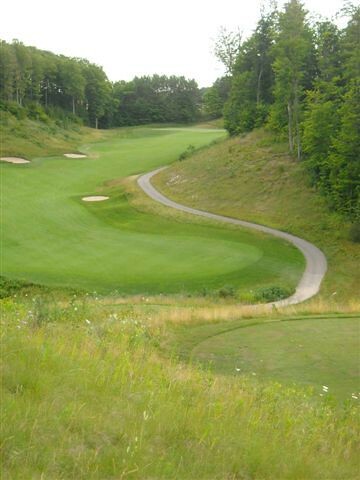 When The Tribute opened in 2002, it turned Otsego Club & Resort from one of northern Michigan’s oldest golf resorts into one of its most exciting. 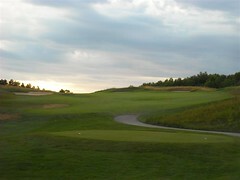 The thousand-acre property the course is built on is the same rugged Sturgeon River Valley terrain that flows away from the resort, beginning with downhill ski slopes, and continuing north through what has to be some of the most dramatic golfing ground this side of Arcadia Bluffs or Whistling Straits. In a word, The Tribute is stunning. With terrain like this, you get big elevation changes, ravine crossings, blind shots – to use another word: excitement. Dramatic, but fair, also comes to mind. 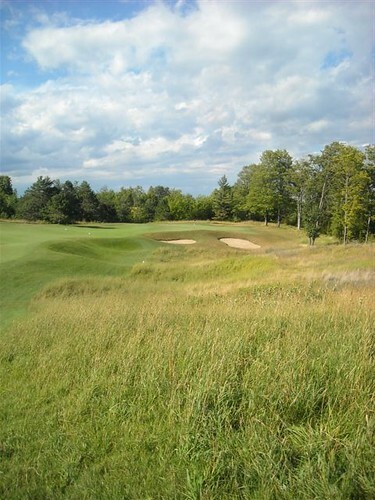 As with many great courses, the holes can sometimes look more intimidating than they really are, and this extreme terrain feeds that effect greatly. 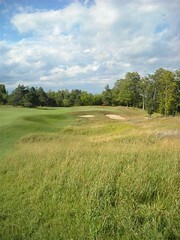 Breathe deep, think about each shot (the course guidebook comes in very handy), relax and enjoy yourself. The dramatic No. 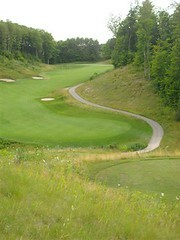 3, a 430 yard par-4 that drops over 100 feet from tee to green, is a prime example. It’s easy to get psyched out, but use all that downhill momentum to your advantage. Pick your spot…nice and easy…keep it in play…Challenging, yes, but never unfair. Fairways are generally wide and spacious, and greens are large and accepting, forgiving from at least one angle, so that short hitters can make their way around without frustration. 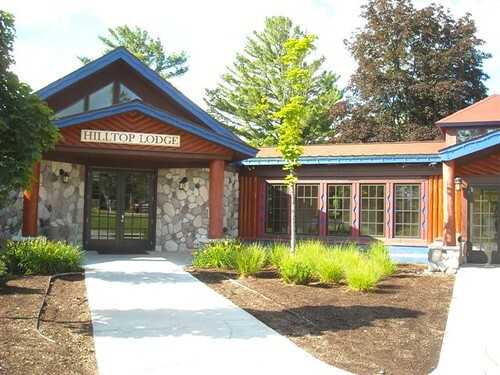 Like the Otsego Resort itself, this course is designed for maximum enjoyment. 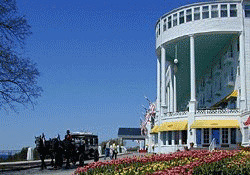 You are out there to have a good time, reveling in nature, on a truly special golf course. How cool is that? Reading the plaque gave me shivers, and it set the tone for revelatory day on the links, remembering how my own father started me out in golf, and about what a great sport it is, especially when played in a dramatic natural setting like this. Looking for a challenge? There are four sets of tees to choose from, stretching to 7,347-yards at the tips. The par-3 ninth plays 240 yards from the back tees, and the carry over a big marshland makes it feel even longer. At this point you’re so far out in the wilderness that you feel eyes peering at you from the forest as you make the turn back towards civilization. This is one of those courses you just have to see to believe. 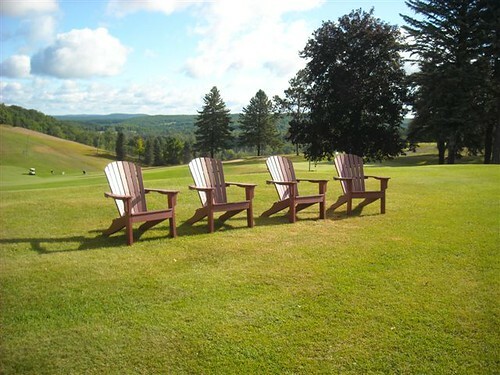 The Otsego ski hill is for club members only, so being able to golf the property gives you a sense of entitlement. It’s a place you really feel privileged to set foot on the first tee. 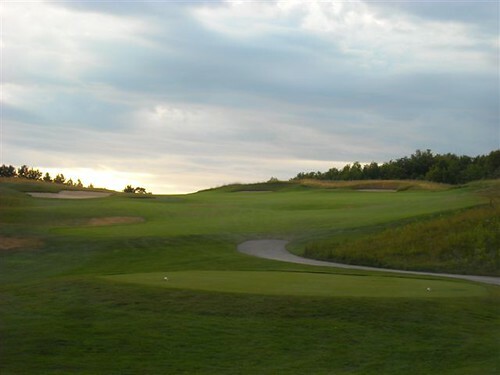 18 beautiful holes and seven miles of cart paths later, you may just have rediscovered your own love of the land, and how well it can be utilized to bring challenge and excitement to the game of golf.